"Type 2 Diabetes is a growing health problem in the United States and around the world. Millions of adults currently from both diagnosed and unrecognized insulin resistance and the side effects of Type 2 diabetes. Although most cases of Type 2 Diabetes are preventable with healthy lifestyle habits, many immutable factors – such as age, gender, and genetics – contribute to an individual’s risk of developing the disease. Check out this infographic to learn about the increasing impact Type 2 Diabetes has on everything from pregnancy to national healthcare expenditures." More than 20 million people in the U.S. suffer from diabetes and almost 12.6 million women who are above 19 years of age have diabetes, according to data from the 2011 National Diabetes Fact Sheet released by the National Diabetes Information Clearinghouse of the United States. Although this is a mind-boggling statistic, it is by no means an irreversible one. With the right diet, medication and exercise, diabetes can be controlled in a way that allows you to live a healthy and happy life. There is no denying the fact that diabetes is particularly tough on women because it affects their health at several levels. According to the American Diabetes Association, young women with diabetes are more prone to cardiovascular diseases than those without diabetes. A diabetic woman faces a much greater risk of miscarriage and is more likely to give birth to children with birth defects than someone who does not have this disease. In women with gestational diabetes, there is a greater chance of developing non-insulin dependent diabetes at some later point. Age is an important factor that affects the development of diabetes in women as is race; the American Diabetes Association estimates that diabetes is 2 to 4 times greater in women of Asian, African American, American Indian, Hispanic and Latin American origin as compared to white women. Birth control is an issue because women who use the pill experience a rise in their blood glucose levels. Long term usage of these pills by women in diabetes may also cause the development of hypertension, resulting in an aggravation of any existing kidney or eye disorders that are diabetes-induced. group of drugs tends to cause ovulation in women who are not in the ovulating phase and this may cause an unexpected pregnancy. Besides this, the high blood glucose level of diabetes predisposes women to repeated yeast infections because yeast thrives on this glucose. Women with diabetes are also more likely to develop menopause earlier than women without diabetes and this in turn tends to increase their risk of heart problems much earlier than the average expected age. Moreover, the hormonal fluctuations that arise during menopause can cause blood glucose levels to rise and dip in unfamiliar patterns, making it difficult to manage the diabetes. How women with diabetes deal with their condition is a major factor that influences the quality of their life. A regular exercise regimen, a healthy diet, regular monitoring of blood glucose levels and taking prescribed medication on time are the key factors that decide the profile of the disease. Research studies increasingly provide evidence of how stress and depression affect blood glucose levels. 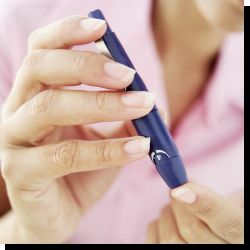 Therefore, women with diabetes need to also adopt measure positive measures to keep stress at bay. The well-known medical information site WebMD quotes this alarming statistic on diabetes. 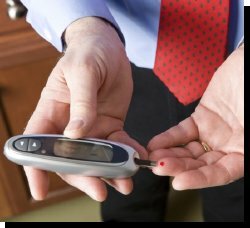 About 12 million males in the United States suffer from diabetes mellitus and of the two types of diabetes; it is the Type 2 or Non Insulin Dependent diabetes that affects between 90 and 95 percent of them. In such individuals, there is a secretion of insulin by the pancreas but this is insufficient to meet the body’s requirements or there is impairment in the body’s ability to use the synthesized insulin. This results in hyperglycemia or high blood glucose because the glucose present in the blood cannot enter the cells. Earlier, type 2 diabetes was also known as “adult onset diabetes” because it generally occurred in people above 40 years of age. In today’s times though, this has become a misnomer because people develop this condition much earlier. WebMD quotes endocrinologist David Ludwig, PhD as saying that persons who have just finished their teenage years and are in their 20s are now commonly found to suffer from type 2 diabetes. The dLife.com Foundation that works to spread information and provide support to people with diabetes quotes certain statistics about the greater risk of complications in men with diabetes. In such men, the risk of peripheral vascular disease that leads to a stroke or heart failure is twice or thrice that of men without diabetes. Similarly, when you compare men and women who developed diabetes before 30 years of age, the men are likely to suffer from a vision disorder called retinopathy much earlier than women. Men with type 2 diabetes exhibit a few distinct features related to their health. This is often indicated by certain symptoms such as low energy levels, a decrease in the lean body mass, and depression is sometimes associated with it. Several factors increase the risk of men suffering from type 2 diabetes. The most important ones are a family history of this condition in the immediate family, an inactive lifestyle, lack of exercise, obesity and a diet that is low in whole grains and fiber and rich in carbohydrate and sugars. As a result of diabetes, men are at a greater risk for a wide range of diseases ranging from eye, kidney and nervous damage to coronary heart disease, hypertension and heart attack. For successfully dealing with their diabetes, men need to pay attention to a few important aspects of their life. They ought to follow a diet that is rich in vegetables, fruits and whole grains even as they reduce the amount of refined and highly processed carbohydrates they consume. When it comes to alcohol, there are contradictory signals with some research suggesting that consuming alcohol in moderate amounts may be a protective factor against diabetes. It is important to emphasize here that the keyword is “moderate” and therefore, men with diabetes should not take more than one or two glasses of beer or wine. Regular exercise that includes stretching, aerobic activity and cardiovascular strength training is also a key factor to keep diabetes under control. The Centers for Disease Control and Prevention estimates that more than 150,000 youngsters aged below 20 years suffer from diabetes. Another surprising piece of information is that while individuals in this group previously suffered mainly from type 1 diabetes, there is currently an increased prevalence of type 2 diabetes. Type 1 diabetes is a result of a total deficiency of insulin because it is not secreted by the pancreas. Type 2 diabetes however is because of insufficient insulin production or the body’s resistance to the action of insulin. Traditionally, type 2 diabetes was more common in adults aged above 40 years but now, a greater number of children and teenagers are manifesting this condition. This is considered to be a natural outcome of the lifestyle of young people who are generally not very physically active. It may also be a result of being exposed to diabetes when in the mother’s womb. Symptoms of type 1 diabetes in children are quite striking; however, type 2 diabetes does not present any such vivid symptoms and this makes it more difficult to diagnose. Moreover, some of the mild or moderate hyperglycemia symptoms such as stubborn behavior, remaining withdrawn, restlessness, lack of concentration, refusing to eat and uncontrolled crying episodes are often considered as bad behavior. Unless a doctor performs a blood test for glucose levels, there is no way of realizing a child has type 2 diabetes. 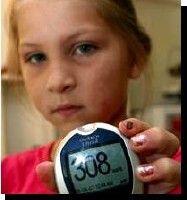 Children with diabetes find it difficult to come to grips with the fact that they are different from their peers. They may rebel against this by ignoring the instructions their parents give them and eat forbidden foods such as sweets, candies and chocolates at school or when unsupervised at home. As a result, controlling the blood sugar levels is much more difficult. Besides, such behavior often puts greater focus on the children and their lack of compliance gets them precisely the same attention that they want to avoid. In case of medical complications, children may have to miss school and this causes them to lag behind their classmates; in turn, this can cause poor academic performance and a subsequent lowering of self-esteem. In some cases, when school personnel are insensitive to the child’s condition, the child may feel embarrassed during classroom interactions and this erodes their self-confidence. Diet planning is an important aspect of managing diabetes in children. Parents ought to explain the reason behind a particular action they want the child to perform. For example, the child should understand the need to avoid eating certain foods or eating more of vegetables although he may not like it. Parents should also encourage their overweight or obese child to exercise regularly. This may be a proper physical activity such as swimming, cycling, running or walking or by playing a physical sport that can help with weight reduction. It is also best to keep the school authorities and teachers informed about the child’s diabetes and give them basic guidelines on identifying the signs of hyperglycemia and dealing with it at the school. Parents can also request the teachers to deal sensitively with this condition without drawing too much attention to the affected child.